Foreign correspondents’ club. Hong Kong government photo via HKFP. 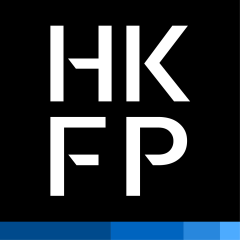 This post is a roundup of reports published between August 4 -10, 2018 on Hong Kong Free Press. The republication is based on a partnership agreement. 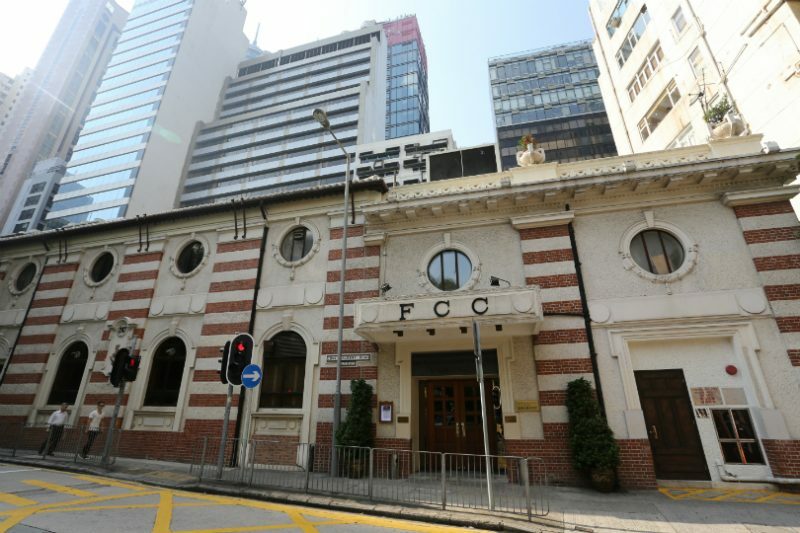 A recent war of words between Hong Kong's former chief executive and the local Foreign Correspondents’ Club shows how Beijing is forcing Hong Kong journalists, both local and international, to toe its political red line. 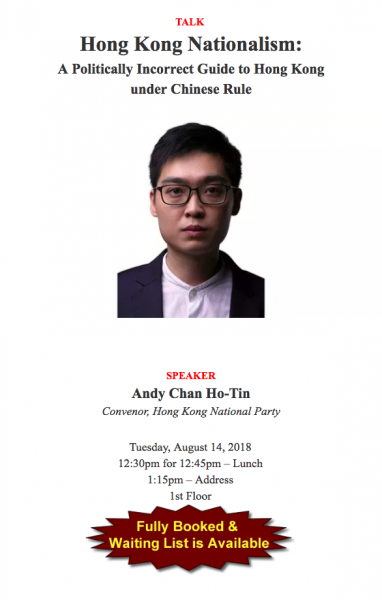 The incident began when the Foreign Correspondents’ Club (FCC) announced on July 30 that political party leader Andy Chan Ho Tin would be giving a talk at the Club on August 14, entitled “Hong Kong Nationalism: A Politically Incorrect Guide to Hong Kong under Chinese Rule”. Hong Kong is a special administrative region of China with more economic and personal freedoms than the mainland, a set-up known as “One Country, Two Systems.” In recent years, Beijing has pressured Hong Kong to pass new laws that strengthen the “One Country” part of the principle. Soon after, a representative from the Office of the Commissioner of the Ministry of Foreign Affairs of China in Hong Kong visited the FCC and urged them to reconsider the decision. Chan is the convener of the Hong Kong National Party (HKNP), which advocates for Hong Kong's full independence from China. Last month, the Hong Kong police society registration department issued a legal recommendation to the Security Secretary to ban the HKNP as a political party. Citing the Section 8(1)(a) of Hong Kong's Societies Ordinance, the department said this would be “in the interests of national security, public safety, public order, protection of freedom and rights of others”. Police handed Chan a 900-page dossier detailing his and the party's activities and articulating their proposal to ban the group. Chan must respond to the dossier by September 4. Announcement for lunch talk by Andy Chan. Foreign Correspondents Club of Hong Kong website. The visit to the FCC by China's Foreign Ministry was not necessarily an indicator of any problem. Media organizations in Hong Kong are accustomed to receiving “political advice” from Beijing representatives. Hong Kong independence is clearly and definitely a red line. Advocating Hong Kong independence is equal to advocating the spit up of the country and is an infringement on China’s sovereignty and territorial completeness. Today the FCC invites Andy Chan to talk about Hong Kong independence, tomorrow it could invite others to talk about Taiwan, Xinjiang and Tibet independence. What would Hong Kong become? In response to CY Leung's comment about the “red line”, Victor Mallett, the first vice president of FCC, reinstated the value of free speech. He further claimed that FCC had been paying a “token rent”. In comments, his followers advocated that the Hong Kong government should take back the property. But CY Leung’s argument has been echoed by many pro-Beijing media outlets and politicians. On August 8, a group of 30 protesters took to the street and demonstrated outside FCC in Central demanding the cancellation of Andy Chan’s talk. FCC has resisted the political pressure and the talk is still set to take place on August 14. Nevertheless, the political pressure has taken effect on other local media outlets. The head of the city’s public broadcaster Radio Television Hong Kong Leung Ka-wing said in a regular meeting on 9 of August that the broadcaster should not be used to advocate Hong Kong independence and banned live streaming of Andy Chan’s speech at FCC. RTHK programme staff union explained that the decision on whether to live-cast an event or not is usually made by section head of different program teams after internal deliberation. It is unusual for the head to hand down a decision in this manner. More than half of local media owners in Hong Kong also serve on Beijing-appointed government bodies such as the National People’s Congress. Even though there is no law in place to prosecute media outlets for featuring political dissents, the FCC saga sends a strong signal to media owners and their news management teams on where the “red line” lies. The effects are more than chilling.